In Bad Medicine, you and your opponents are huge pharmaceutical companies. Your goal is to create names and advertisements for new drugs to cure the current Malady, while downplaying any side effects the folks at the lab may have discovered. Each card in the game has a little bit of a drug name, a little bit of a description, and a side effect. There will be one card dealt in the middle of the table; its side effect is the malady to cure this round. 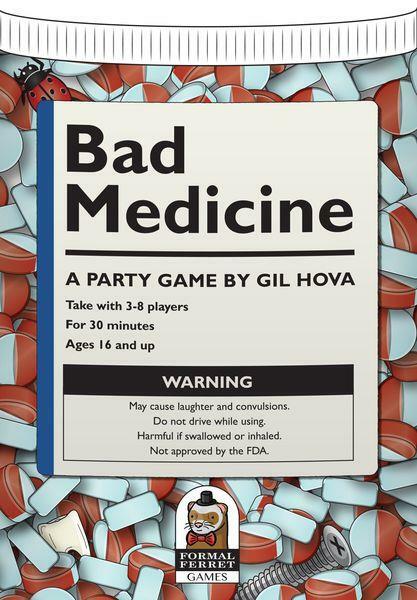 In a 3-4 player game, each player gets seven cards, and chooses three cards for their drug names and two cards for their descriptions. Once everyone has chosen their cards, everyone pitches their drug in turn. While one player is making his pitch, the other players pass a card to the pitching player. The pitching player chooses one card to incorporate into his pitch as a side effect, and explain why it's not as bad as it sounds. The player whose side effect got chosen gets a point! In a 5-8 player game, players split off into teams. One player on a team gets six cards, and chooses three cards for their drug names, two cards for their descriptions, and one card for its side effect. He passes them all face-down to his teammate, who won't see the cards until she starts her pitch! After all players have made their pitches, everyone votes on their favorite drug. Players score points for getting votes, and teams rotate every turn. The player with the most points after four rounds wins!